Whirley Life: My feet are great. Parker just loves his feet. Really loves them, he spends hours just holding on to them. When he's falling asleep, he has his feet in his hands. When he's up and playing, its the same story, feet all the time. This probably explains why he loves to spend most of his time on his back. He can't see his feet while he's on his tummy. The last time his Grammy Lewis came to visit, she bought him this set of nifty socks. I think he was too young to enjoy them at the time. I pulled them out this morning and he was enthralled. Feet with noise-making socks on them are even better than naked feet. 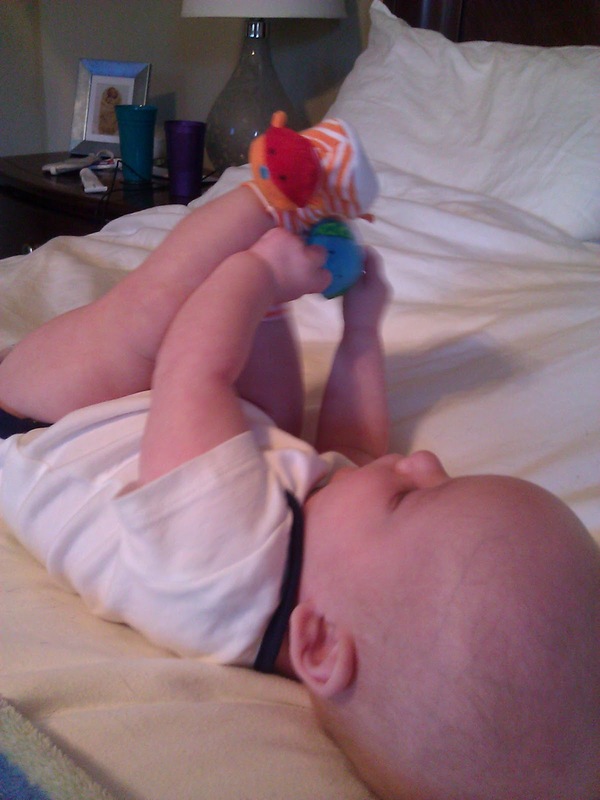 It takes him at least 20 minutes to get his rattle socks off. Once he gets them off, he gets fussy and it takes me another five minutes to get them back on...definitely a win-win.